Welcome to The Cafe, come and visit us and tell us what you think! 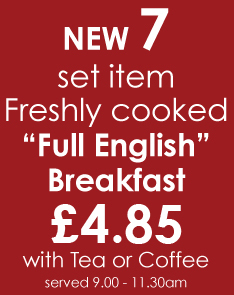 READ one of our newspapers as you start the day with our home cooked breakfast. RELAX with a delicious cappuccino or latte, all made with top quality beans from our specialist coffee roaster. INDULGE yourself with a light snack or tasty gateaux from a wide selection to tempt you! ENJOY a hot home made special of the day or maybe a panini or freshly prepared sandwich. SPOIL yourself with a delicious scone and jam or one of our home baked, fresh cakes – you deserve it!! We have been awarded 5 stars by the Warrington Council scores on the doors scheme.